This celery chowder recipe gives you all of the benefits of celery as well as the benefits of carrots. Directions: Blend half of the celery, onion, zucchini and pepper with the garlic, carrot juice and celery juice. Add the remaining vegetables, minced parsley and salt to taste. Mix well and enjoy! 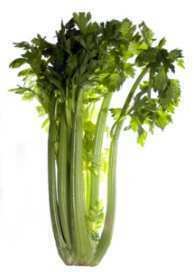 The array of vitamins A, several of the B complex vitamins including vitamins B1, B2, B3, B5, B6, folate, vitamin C and vitamin K in celery are impressive as are aspects of celery nutrition. The vitamins in celery are just a small part of the nutritional value of celery. The nutritional value of celery includes essential minerals such as boron, calcium, chlorine, iron, magnesium, manganese, phosphorous, potassium, selenium, sodium, sulfur and zinc. Add to this array of minerals, celery also contains several amino acids and it is rich in health promoting fiber. Kitchen Tools I really LOVE!